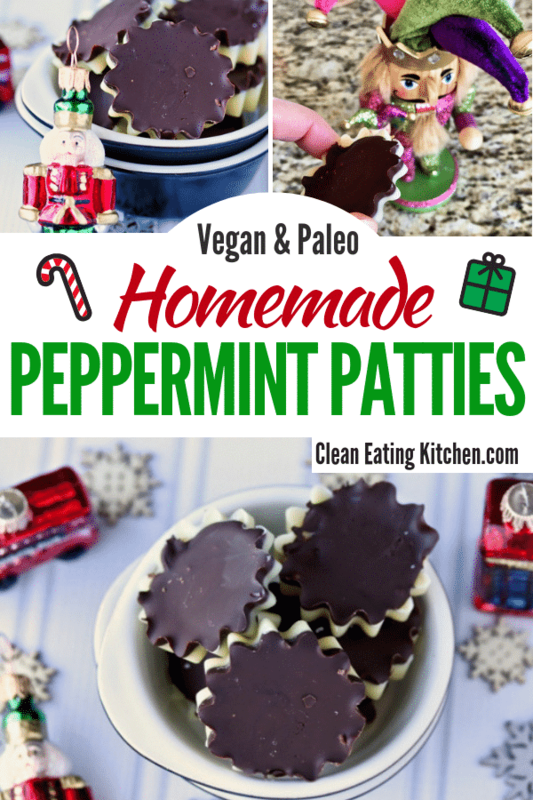 You’ll love this vegan and paleo recipe for Homemade Peppermint Patties. They are so fun and yummy, and made without oil or refined sugar. 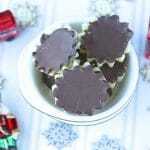 I’ve made chocolate candies in the past, but this is the first time I’m sharing a recipe. It’s actually not that hard! My recipes has six ingredients, but it’s still easy to make. I love the combination of coconut butter and cocoa butter because the texture is amazing, but not overly coconut-flavored. You’ll see from the photos that these aren’t the pretty peppermint patties that you buy in a store. This homemade version will have imperfections in appearance, that’s just how it goes, but I promise you the flavor makes up for any visual flaws. Combine coconut butter and cocoa butter in a small saucepan over low heat. Stir until the coconut and cocoa butters are melted and remove from heat. Whisk in the vanilla, honey, and peppermint extract. Use a serving spoon to carefully pour the mixture into a silicone mold (I used this one) or a mini muffin tray. Place the mold or tray into the freezer for at least 30 minutes to set. This will be the bottom layer of your peppermint patties. After 30 minutes, remove the tray and set aside. 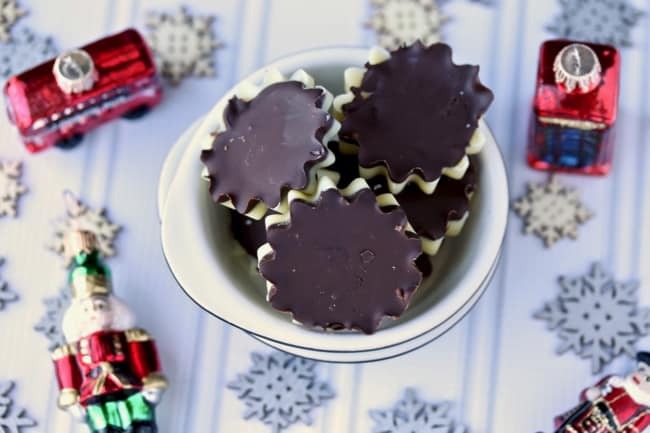 Place the chocolate baking chips in a double-boiler or a microwavable bowl. Heat until just melted, stirring until smooth. Pour the chocolate over the peppermint patties to form the top layer. Place your mold or tray back in the freezer for at least another 30 minutes or until the chocolate has re-solidified. Carefully remove the patties from the mold or tray and serve cold or slightly cool. If your house is warm, keep leftovers in the fridge so they don’t melt. 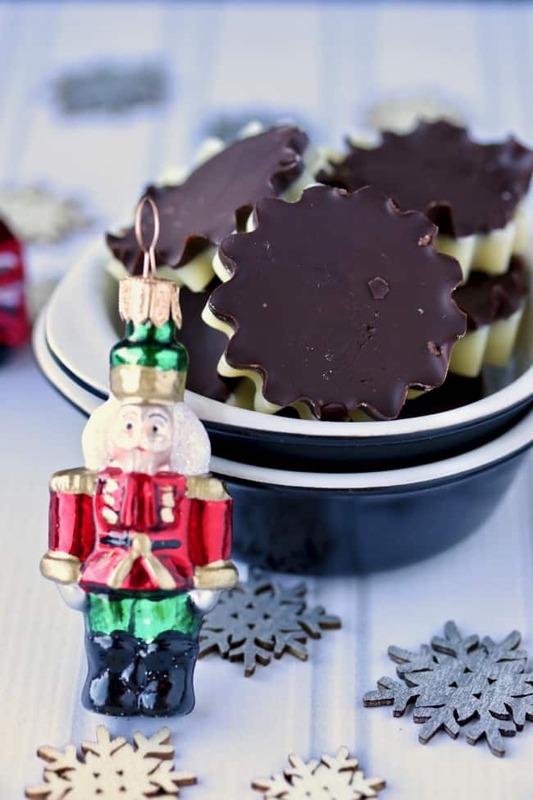 Pin this Homemade Peppermint Patty recipe to your favorite Pinterest board! Oh wow! No way! My girls would love making these! What a fun treat! I have to make these for my son! He loves peppermint, he calls is spicy! haha! When I was growing up we would always have Andes chocolate mints on Christmas. It was a favorite thing for me to eat since I was in charge of putting them out for our guests and I’d always sneak in a few while doing that. But who knows what’s in those. 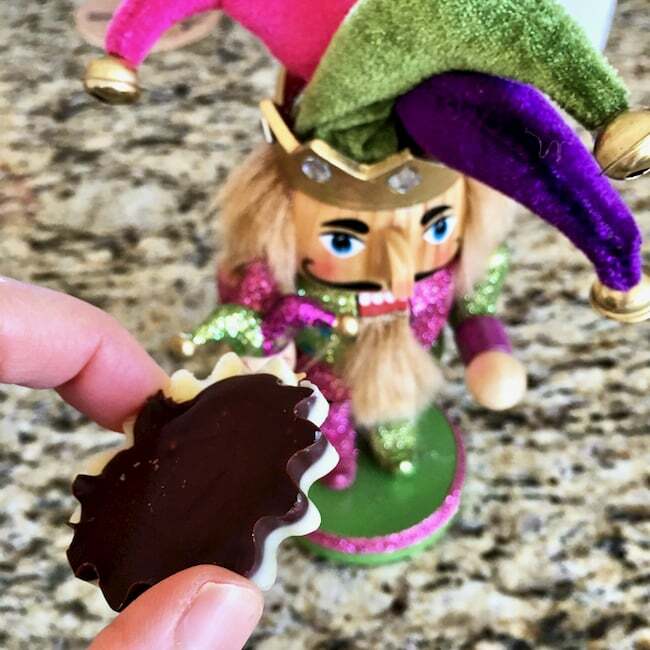 These look wonderful and much healthier and even though it’s now past Christmas I might have to restart my tradition 🙂 Or maybe make a New Year’s Eve mint tradition? Michele, I think I ate my weight in Andes mints at least several times over as a teenager! Those things are sooooo good! But, you’re right, I’m sure they’re filled with horrible things I don’t even want to think about. 🙂 I hope you enjoy this recipe with much “cleaner” ingredients. Happy holidays!!! XO. Chocolate and mint are so magical together! These look super yummy ???? I so agree, Stacey! Happy New Year!!! These sound so delicious! This is one of those recipes that makes me so sad I’m allergic to coconut. I wonder if it would work with additional cocoa butter instead–what do you think? Becky, this recipe would definitely work with just cocoa butter and no coconut. In fact, I would probably prefer it that way since I’m not into coconut right now. Make some and send me one? 🙂 XOXO. Ahhhhhh! Just when I thought I had made every dessert on my “must make” list, I find this one! My favorite flavor combination to boot! Love love peppermint flavored patties ! It goes so well with coffee or whenever I need a healthy snack ! Thanks for sharing. Yum!!! This is one of my favorite flavor combos! I wish I had some of these to snack on today! Me too! 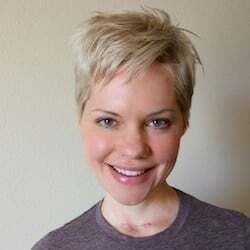 Thanks, Emily, and Happy New Year!!! Ooh these are so cute and look absolutely perfect for winter – yum! What a fresh wintery treat! Nom. Wow Peppermint Patties! Perfect for Christmas!